Please refer to our stock # BSK79 when inquiring. DESCRIPTION: An attractive Asian fishing creel, fashioned from woven split bamboo with wood base and neck, and an attached tightly woven string for hanging. 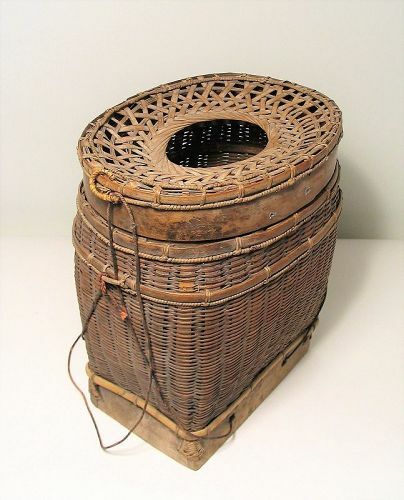 A creel is used for carrying fish or blocks of peat moss which function as an evaporative cooler when dipped into a creek, keeping the catch chilled. This type of creel with a woven, partially open top can also be used to catch lobsters and other crustaceans. Good condition with a nice aged patina. DIMENSIONS: 9” wide x 11” high x 6 ½” deep.